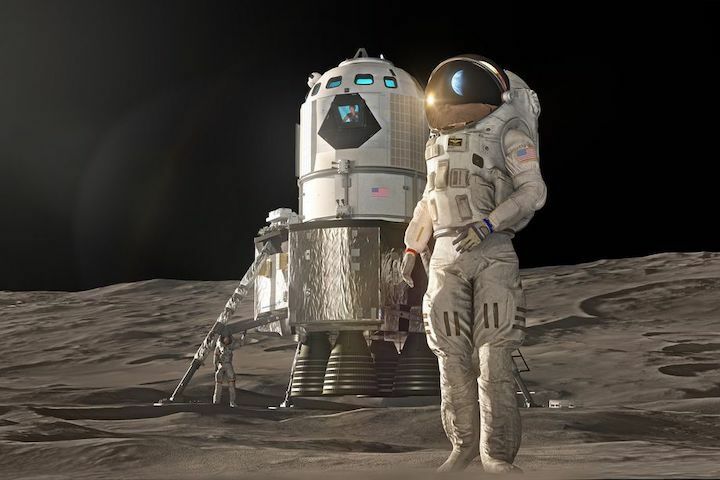 To help NASA meet its new goal of getting to the Moon by 2024, longtime space contractor Lockheed Martin is unveiling new designs for a human lunar lander concept that can take people to and from the lunar surface. And the company says it can be ready within the next five years — as long as it has enough resources. The vehicle consists of two elements: a lander portion that can travel down to the ground, and an ascent vehicle that can lift astronauts off the Moon’s surface. The lander is meant to travel to and from a new space station that NASA wants to build around the Moon called the Gateway. If all of these elements are created, astronauts would travel to the Gateway from Earth and then take the lander from the station to the Moon. The ascent vehicle would then bring them back to the station. This new lander is separate from another lander concept that Lockheed revealed last year at the International Astronautical Congress. That design called for a much heavier, reusable lander that could take astronauts to the Moon and back in one piece — without the need of a separate ascent element. But after Vice President Mike Pence directed NASA to move up the landing deadline to 2024, Lockheed has been working on a design that could be developed much more quickly. Meanwhile, the ascent portion of the vehicle, perhaps the most critical part, will use engines derived from a piece of hardware called the Orion service module. This module is a cylindrical vehicle that rides into space along with the Orion, providing power and support during flight. According to this design, the ascent vehicle — which must work to transfer astronauts off the surface of the Moon — will also have some elements that have seen spaceflight before. If current schedules hold, the Orion crew capsule and the service module will have flown together at least twice in space before a lander is needed in 2024. 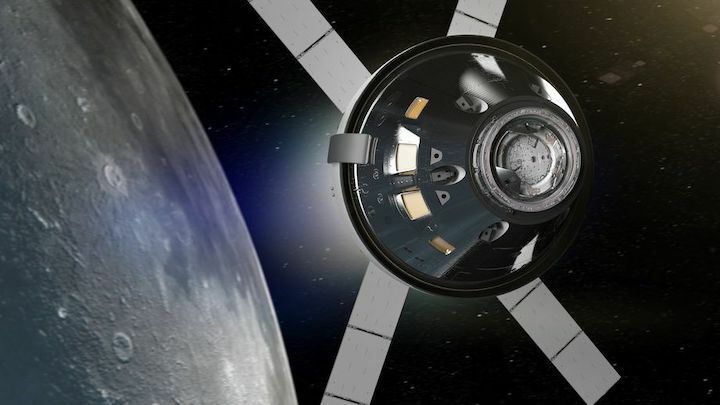 An uncrewed Orion capsule is slated to fly by the end of 2020 on a trip around the Moon, followed by a crewed mission around the Moon in 2022. Lockheed argues that will allow NASA to evaluate the performance of the systems on both Orion and the module, and ultimately test many of the technologies that the lander will use. Of course, Lockheed’s timeline for its proposed lander is dependent on NASA being able to finish the Gateway in time for 2024. Originally, NASA was aiming to complete most of the station by 2028, when the first humans would land on the Moon’s surface. The full Gateway calls for multiple modules to be strung together, creating a temporary home and research facility for astronauts. But now that the deadline has moved significantly, sacrifices to the Gateway design are going to be made. Now, NASA essentially wants to put up a much smaller version of the Gateway into lunar orbit first, according to Bridenstine. Lockheed envisions this new paired-down version consisting of two elements: a module that will provide power to the Gateway, as well as a small habitat module, or a node, for astronauts to pass through. This node will have a docking port for Orion and one for the lander. 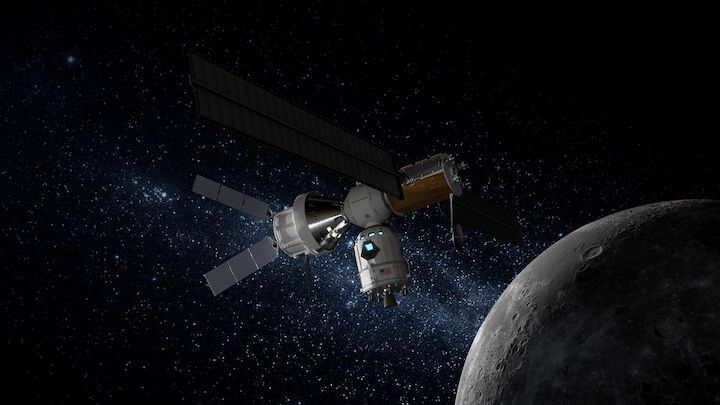 As part of Lockheed’s plan, NASA would launch these two main Gateway elements sometime before 2024, though the space agency has not decided which companies will build the modules yet. Then once this tiny Gateway is in space, the lander would launch to the station, potentially on a commercial rocket, and dock with the habitat. Finally, a third flight of the Orion crew capsule would launch, bringing people to the Gateway. They would then pass through the small space station into the lander and potentially make the first lunar landing. After NASA achieves the coveted “boots on the Moon,” then the space agency will focus on its second phase of the lunar return: sustainability. That entails fleshing out the rest of the Gateway and using more reusable vehicles to go back and forth to the lunar surface. While Lockheed’s lander concept may be developed quickly, it’s only partially reusable, since the lander portion of the vehicle will remain on the Moon when it’s no longer needed. NASA has not made any decisions yet on which companies will build the first human lunar landers and the agency still needs to come up with a budget for this accelerated Moon return, which should be unveiled next week. Lockheed acknowledged that if the company is chosen, it will have to work quickly to meet 2024, and it won’t work if they don’t have the right funds. “We need to be bending metal next year,” Rob Chambers, director of human space exploration strategy for Lockheed Martin, said at a press briefing.